Being known as the person with the stinky gi in class is not a good reputation to have. Ideally, this traditional uniform worn by judo and jiu jitsu practitioners need to be kept consistently clean and smelling fresh. Beyond the odor aspect, it is important to wash the gi between training days to eliminate bacteria and viruses. This article provides instructions on how to properly wash and dry the gi. The following content is a gi washing routine that takes into account the differences between top-loading and front-loading washers. Tie Knots - Before placing the gi pants into the washer, make sure to tie its drawstrings into knots. I recommend tying it into a double knot to make sure that it does not become undone during the washing and drying process. Furthermore, a knot will prevent the pants drawstrings from being tangled with other laundry content and being pulled out of the pants itself. Inside Out - Normally turning clothes inside out before putting them in the washer is important for protecting the gi’s colors and graphics. Distribute Placement of Gi - If you are using a top-load washer, then distribute the placement of the gi top and pants evenly inside the basket. Otherwise, an unbalanced content may cause the washing basket to thump around. 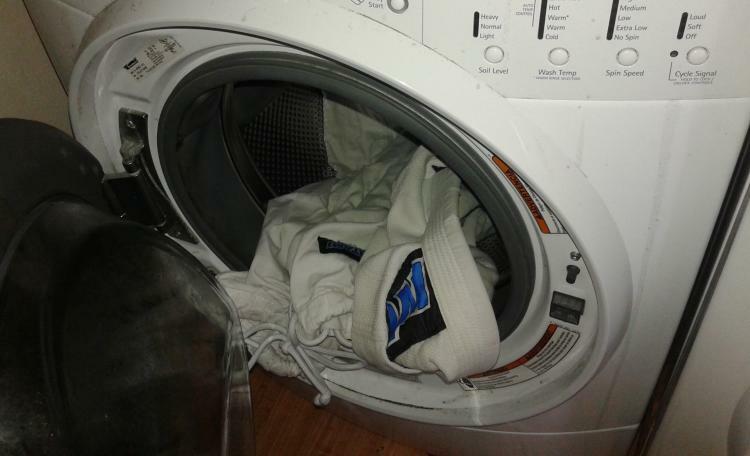 Those using a front-loading washer can simply toss their gi clothing inside. Laundry Additive - The items below are recommended for adding into the washer for a thoroughly cleaned gi. Please be careful about using bleach since it may speed up the deterioration of your gi. Alternative Additives - The two additives below will supply further benefits to the laundry additive mentioned above. Defense Soap Super Shield Plus - This fluid will provide antimicrobial protection to the gi fabric from bacteria, viruses and mold. Downy Unstopables - I have found these scent booster to be very effective in having my gi smell amazing. Cold Wash - Wash your gi in cold water to prevent it from shrinking. Soak - The subsequent comment deals specifically with top-loading washers. If possible, let the content soak with the detergent and other additives. If you want to be extra diligent, let your machine run a bit. This action will agitate and help mix everything together. You can then stop the washer and let your clothes soak by lifting the washer’s lid and keeping it open. Let it soak for roughly 10-30 minutes. If the gi has been sitting in the laundry basket for more than a couple days, try letting it soak for longer. Please put superstition aside and wash your belt for the safety of your teammates as well as yourself. You will not lose your skills and techniques when you do so. Think about the numerous techniques where a teammate uses your belt as a grip hold. Furthermore, you are the one that touches the belt the most. Therefore, it is essential that the belt is washed along with your gi. Most gi have a tendency to shrink, especially during the drying process. The methods below will minimize this effect. Hang Drying - Hang drying is the best method with the least chance of shrinking your gi. Those hang drying their gi should leave it in a place where there is enough air circulation for the fabric material to dry thoroughly. Be careful not to leave it sitting out in direct sunlight as it might affect the coloration of your gi. You can also speed up the drying process by placing your gi items in front of a fan. Drying Machine - If hang drying is not a suitable selection or you want to simply speed up the drying process, the alternative solution would be to use the dryer. I tend to always add a couple sheets of fabric softener when drying my clothes. Air Dry - Setting the heat level to air dry is ideal for tumbling and reducing the amount of water present in a dripping-wet gi before hanging it dry. It is also a great setting for heat-sensitive clothing. Low Heat - Low heat is the next best setting if your dryer does not have the air dry option. This low heat may cause your gi to shrink, but any other heat selections would then cause your gi to shrink dramatically in comparison to it.